Maceoo label. Photo by ReviewerPhoto.com. Reviewer Rob in a Maceoo shirt. 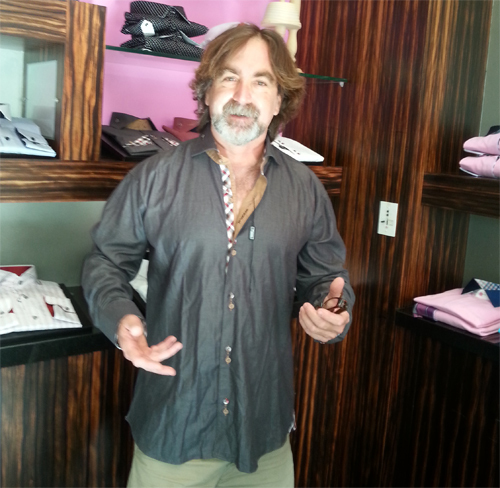 The people at Maceoo specialize in mens’ designer shirts, mens’ dress shirts and mens’ french cuff shirts. But they’ve also got some big, colorful and kitchy knit sweaters, if you want that loud holiday season cold weather garment. Above at right: The totally amazing Reviewer Rob wearing Maceoo, and, at left, the Maceoo label. Below: Maceoo mens’ shirt with plaid detailing on button seam and on inner cuffs. All these shirsts are listed online at $169. Modeled by Madison Eddy. Photo by Rob at ReviewerPhoto.com.